You'll be £25.00 closer to your next £10.00 credit when you purchase Visiting the Fallen - Arras North. What's this? Like Ypres, Arras was a front line town throughout the Great War. From March 1916 it became home to the British Army and it remained so until the Advance to Victory was well under way. In 1917 the Battle of Arras came and went. It occupied barely half a season, but was then largely forgotten; the periods before and after it have been virtually ignored, and yet the Arras sector was always important and holding it was never easy or without incident; death, of course, was never far away. The area around Arras is as rich in Commonwealth War Graves Commission cemeteries as anywhere else on the Western Front, including the Somme and Ypres, and yet these quiet redoubts with their headstones proudly on parade still remain largely unvisited. This book is the story of the men who fell and who are now buried in those cemeteries; and the telling of their story is the telling of what it was like to be a soldier on the Western Front. 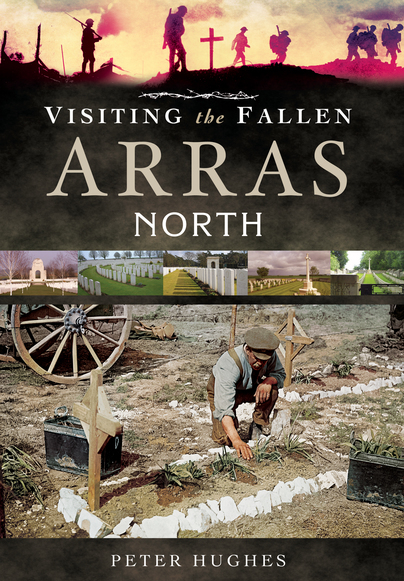 'Arras-North' is the first of three books by the same author. This volume contains in depth coverage of almost sixty Commonwealth War Graves Commission cemeteries and is a veritable 'Who's Who' of officers and other ranks who fell on this part of the Western Front. It provides comprehensive details of gallantry awards and citations and describes many minor operations, raids and other actions, as well as the events that took place in April and May 1917. It is the story of warfare on the Western Front as illustrated through the lives of those who fought and died on the battlefields of Arras. There are many unsung heroes and personal tragedies, including a young man who went out into no man's land to rescue his brother, an uncle and nephew killed by the same shell, a suicide in the trenches and a young soldier killed by a random shell whilst celebrating his birthday with his comrades. There is an unexpected connection to Ulster dating back to the days of Oliver Cromwell and William of Orange, a link to Sinn Fein and an assassination, a descendant of Sir Isaac Newton, as well as a conjuror, a friend of P.G. Wodehouse, a young officer said to have been 'thrilled' to lead his platoon into the trenches for the first time, only to be killed three hours later, and a man whose headstone still awaits the addition of his Military Medal after almost a century, despite having been involved in one of the most daring rescues of the war. This is a superb reference guide for anyone visiting Arras and its battlefields. This is one certainly to keep in your car when you visit the area. Over the last few years, as I and my family have travelled in Europe, I do tend to stop whenever I pass a sign to one of the Commonwealth War Graves Commission sites, and they are always so smartly kept. To have this sort of reference to learn more about many of the graves you will see when visiting them I think helps keep the memories of these individuals and their own stories and contributions to our history helps keep that memory and understanding alive. It is a remarkable work of interest and dedication on the part of the author and certainly recommended. The book is formed of a number of chapters and in each one several cemeteries are examined. These range from small communal cemeteries with only a handful of graves to large burial grounds like Cabaret Rouge with several thousand. The author has broken up the Great War battlefields around Arras into several areas which will form the trilogy of books and this volume looks at locations north/north-east of Arras itself. As such it covers the Vimy Ridge area in some detail and along with it the Canadian contribution to the 1917 battle. For each cemetery background detail is given, often in some greater depth that the online Commonwealth War Graves Commission entries, which is to be welcomed. The author has picked a number of soldiers per cemetery and then discusses their life and war history. For some cemeteries there are a few such ‘cameos’ but for the larger ones, it can run to dozens. There are some great stories looking at men like Harvey-Kelly, the first RFC pilot to land in France to better known people like war poet Isaac Rosenberg. It really does give a good cross-section of the sort of men who fought and died at Arras in 1917. ... This publication adds a voice to the many white headstones in the silent cities around Arras and will be of benefit to anyone visiting the battlefields in this area. I look forward to future volumes, and perhaps some covering areas beyond Arras too. The first of three planned volumes covering the Arras area, this excellent book serves to aid visitors to the battlefields and cemeteries, not in the sense of a traditional guidebook, but more as a testament to those who fell there, as the author has rather uniquely provided personal biographies and information about many of those buried and commemorated in the area, making this a very personal and intimate book which readers of this magazine will take to quite readily and enjoy. When visiting battlefields, one can become overwhelmed by the sheer amount of headstones and names. Each one only contains basic information, and wandering through the neatly manicured rows of the Commonwealth War Graves Commission cemeteries it can often be difficult to ‘feel’ anything when little is known about the burials and the context in which they lost their lives. This book attempts to provide a remedy to this. The result of what must have been a considerable amount of research, it provides details and vignettes about some of those buried in the cemeteries. This first volume focuses on the Arras north sector, with a further volume for Arras south and one focusing solely on the memorials in the area...The book launches straight into accounts of the cemeteries and those buried within. However, details about each cemetery give some indication as to its significance to the events that took place. What I enjoyed about the book was the amount of information I picked up whilst reading it, particularly about the campaign of 1917... With 59 cemeteries featured in the book, I think the author should be commended for the effort and research he has put in to producing this volume.